Home / SpotLight / Spotlight: Jerkbaitmania PikeSkinz Predator fibre. So real they can’t resist! 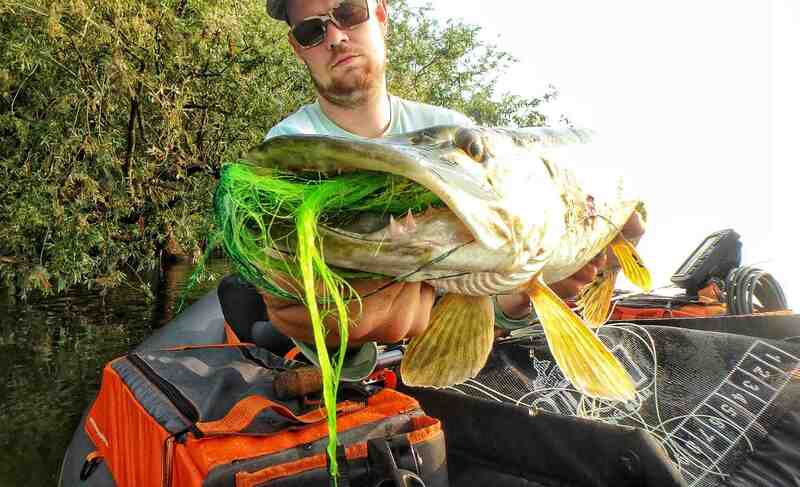 Fly-fishing is hot, and so is tying flies for predatory fish like Muskie & Pike. In the world of fly-tying, there are an incredible amount of great materials that can be used. Synthetics are one of them. If you’ve ever set foot in a fly shop, you have probably noticed the fierce amount of material available. A while ago, Chris Chandler from Jerkbaitmania, a UK producer and distributor of fly-tying products, released something truly special. A kind of synthetics based on the H2o fibers, but very flexible, strong and soft. I was provided with a good pack of material and was immediately impressed. 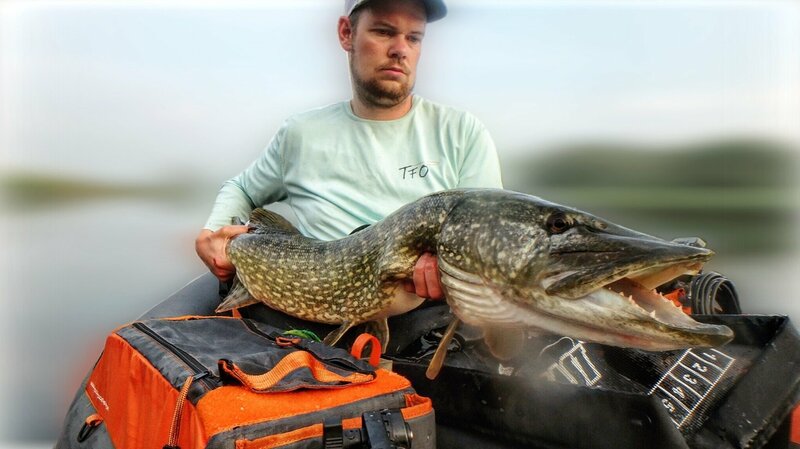 Besides the fact that Chris puts out a very large selection of his ”PikeSkinz”, he also hand blends various colors to make unique combinations. Colors such as Neon Musky, Metallic Black, Hot Purple Esox, and a personal favorite, Dark Esox. Besides the ordinary range of synthetics, there also great brushes available, blend or normal style. Synthetic Buford brush heads, for those who don’t know how to tie in the bucktail style, and more. There really is a great selection of fibers that can be used. The biggest thing about using synthetic fibers is that they don’t take on water. There’s a huge benefit from tying with this kind of material, and that is it can be tied in very bulky, but with less amount of weight and air resistance. Usually when tying with natural materials, less is more, but in this case, more is better. Predatory fish like the Pike, like a large profile, so if you are able to create something like that with minimum efforts, you’re in for a treat! Of course, there are limits, but with this material being so light and strong, you can easily make a bulky fly. 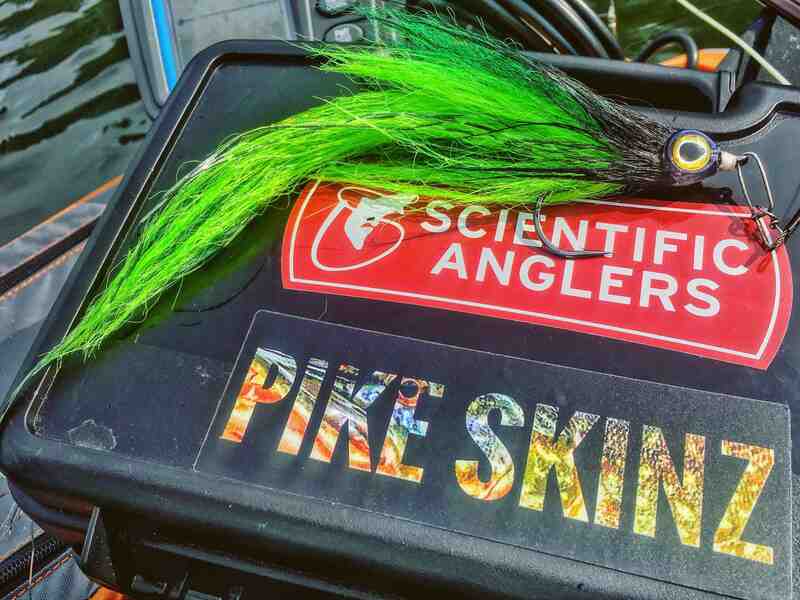 Where other fibers have a hard time coming to live in the water, PikeSkinz predator fibers really move, and no wonder that it drives fish absolutely crazy. All across the US & Canada, Muskie and Pike fly-fisherman are taking notice of this product and for a good reason. They just plain catch fish. No matter if you’re just starting out, or are already a professional angler, anyone can make a fly with these fibers. They are very easy to tie in, and due to their softness, up for a wide range of patterns. Some colors like Electric Yellow, Electric Lime, Neon Mahi and the Neon Pink have UV included. My personal favorite pattern to tie with the PikeSkinz are deceiver type of flies, and this material is just exceptional for that. With minimum effort, I can make a truly effective fly in minutes. Because the hardness of all the predator fibers is the same, I can blend in as many colors together as I want, and tie a unique fly. This is probably the biggest benefit of the synthetic material itself. The endless combinations that can be made. No matter what ideas roam inside your head, they can be done. If you stick to the 4 key elements principle of fly-tying, endless variations can be made. In my ”Receiver” type of flies, for example, I like to put in a flash, Hedron barred magnum flashabou and bucktail. The flies are as big as possible and tied on a Partridge of Redditch CS86X 8/0. They are bulky but not heavy at all, and catch fish like there’s no tomorrow. All because of the perfectly balanced blend of fibers and their softness! 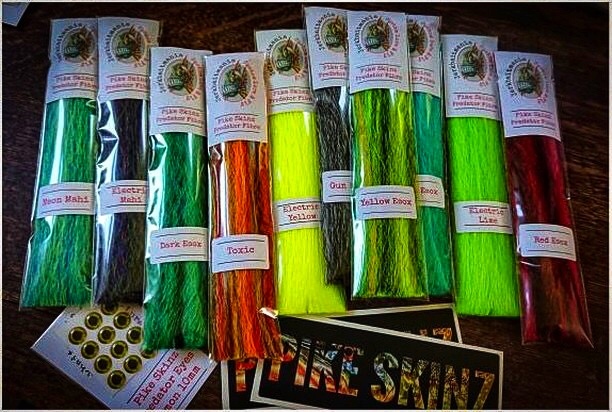 The PikeSkinz predator fiber packs come in a great number of fibers for the money. They’re cheap, but high quality, and will easily lasts multiple fish when tied in right. All packages are cut around 8 inch or 22cm in length so that it enables you to make flies up to 10 inches. Just about the perfect size of any Esox fly. Again the variations of the fibers are all up to you, and you can do as much with them as you would possibly want to. The sky is the limit tying with PikeSkinz, and I’m sure if you have never tried them out, you are in for a treat. 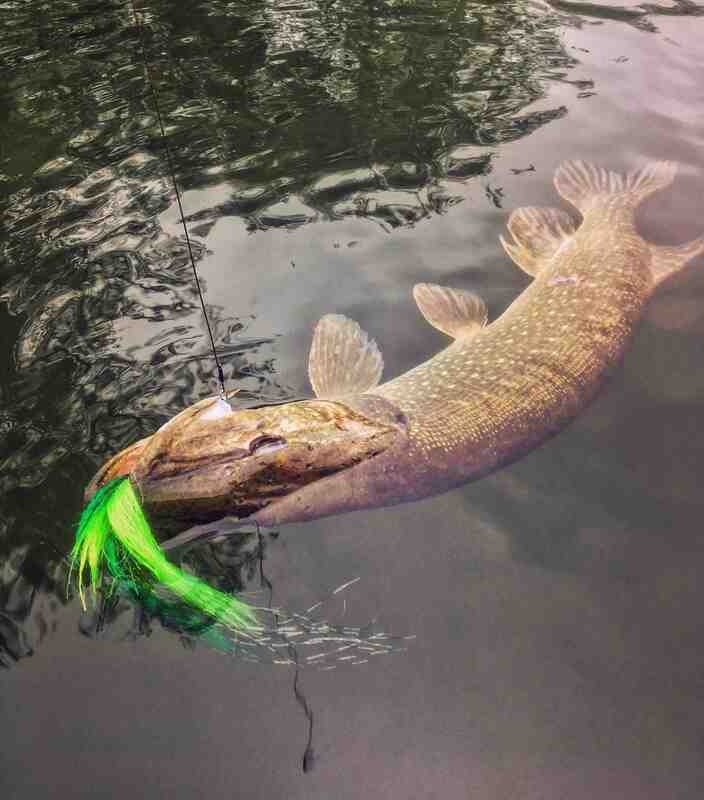 They certainly upped my catching rate of Pike when I started using them and already caught some great fish! Click on the logo down below, and you will be directed to the Jerkbaitmania shop right away!